Nancy, of NobleKnits.com puts out a really cute newsletter. In her latest, she outlines the Top Ten Reasons To Knit With Cotton. Cotton is hypoallergenic. It doesn’t irritate sensitive skin or cause allergies. Cotton is soft and never itchy. It doesn’t cause static electricity. If cared for properly, cotton is long lasting. Cotton blends well with other fibers. Cotton is highly absorbent and produces vibrantly colored yarns. It draws heat away from your body to keep your skin cool and comfortable. Cotton does not contain any chemicals making it a natural fiber. Cotton has individuality & character. Each fiber grows a little differently–with sunshine & soil–and takes on characteristics that indicate its life & style… just like the people who wear it. The Bolero Style sweater above is knit from Knit One, Crochet 2’s Ty Dy Yarn. I’ve knit with this before, and it’s really soft. Does split a bit, but that tends to be a cotton thing. You’ll never guess what color I used. Ok, yeah, it was green, and the item I knit was never finished. 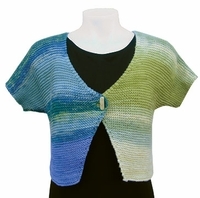 The yarn – really gorgeous flowing colors, the vest pattern? Not so much, but this Bolero is more my style. Do I smell a tinking session? wow, need to look for this!